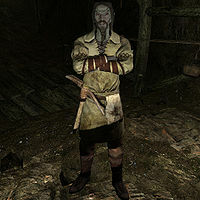 Sondas Drenim is a Dunmer food vendor and a resident of Darkwater Crossing who works at Goldenrock Mine. Upon first talking to him, he will mention the fact that many workers are getting sick. He expresses his concern by saying "We're getting to the point where the tunnels are getting deep into the rock. People complain of bad coughs and foul air. I've seen this before. We need some medicines to combat the ore dust. I was about to send a message to Windhelm for aid." You may then offer your assistance. Sondas will request you take his note to Quintus in Windhelm. Once delivered, Quintus will reward you, but Sondas will never mention it again. However, he will become a potential candidate for marriage. Sondas wears a set of barkeep clothes along with a pair of shoes. He wields an iron dagger and carries a pickaxe along with a selection of lower-class loot and gold. According to Hrefna, Sondas takes care of her if her mother is away. He is also worried about Derkeethus and will warn you by remarking, "Those falls... dangerous place. Derkeethus thought he could find some good fish in the pools. Haven't heard from him in a long while." He has a huge amount of experience working in mines and he will be quick to tell you that, "This mine is only a few years old, but I've been digging up ore for over a century." It also becomes clear that he does not care about his homeland when he tells you, "I keep hearing stories about Morrowind. Sounds like a wretched place." You can ask him if the ongoing war has affected him, and he will explain, "I'm lucky enough that none of my friends have been killed. Of course we have soldiers coming through all the time." Should you chose to marry him and move to one of your houses you will see Hrefna in your house every so often since Sondas "watches" her while her mother is away. Hrefna: "Sondas, I've heard about Morrowind." Sondas: "Oh? What about it?" Hrefna: "That it was black and gross and nobody wanted to live there anymore." Sondas: "I'll have to take your word on that one, my dear." Hrefna: "Do you ever want to go to Morrowind, Sondas?" Sondas: "I've been in Skyrim my whole life. Why would I want to leave?" Hrefna: "To see the fires!" Sondas: "I think I like the lake here just a little more." Tormir: "Thanks for looking after Hrefna." Sondas: "Oh, it's no trouble. She's a smart little girl. Might talk your ear off, but she's fun." Tormir: "Well, I know she thinks the world of you." Sondas: "Well, I'll try to be a good influence, then." Tormir: "Sondas, does Hrefna ever mention Meieran to you?" Sondas: "She hardly mentions anything else." Tormir: "I'm just worried about what he's teaching her." Sondas: "I wouldn't worry about that. He's a good elf. I trust him."